Israel is the world's 3rd largest ($) exporter of dates worth $151 million in 2014. The UK is Israel's 3rd largest market for dates worth $23 million in 2014 (10,000 tons). 60% of the world's Medjool dates are produced in Israel (2013). Israeli settlements built on stolen Palestinian land have been ruled illegal by the International Court of Justice. Nearly half of the settlements in the Jordan Valley grow dates, it's their most profitable crop, and contributes significantly to their economic viability. 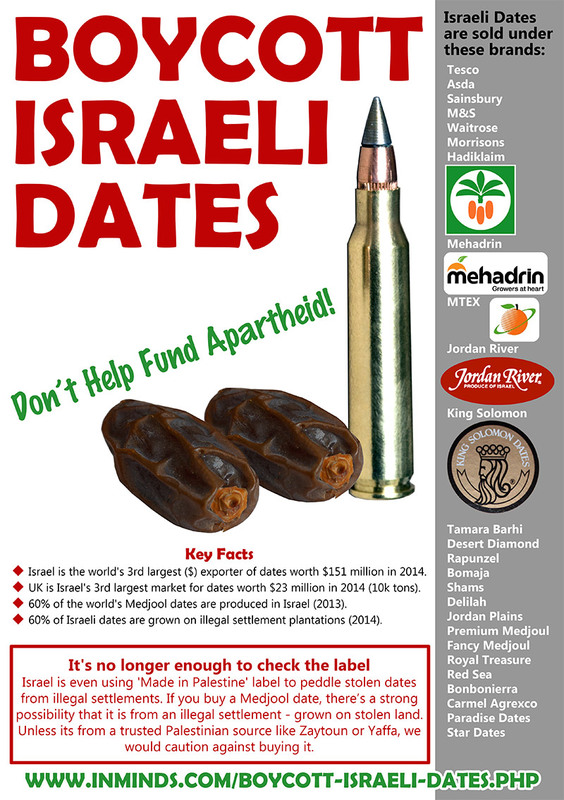 80% of settlement dates are exported, making up some 40% of all dates exported from Israel. If you oppose the settlements then target their dates. Picking of the dates is hard work, Israeli settlers bring in low paid Palestinian labourers to do this back breaking work. During the pruning season, workers are dropped on the date palm trees by a hoisting crane at 5 in the morning, left perched on palms that soar to heights of 12 metres - a 4 storey building, left there swaying in the wind for up to 8 hours without even a toilet break, with no means to come down until the crane returns at the end of the day, the workers cling to the tree with one arm and work with the other to meet their quota. If they fall behind they will lose their jobs. Every year Israel expands its share of the global dates market - up 16% in 2011; up 23% in 2012, it surpassed Saudi Arabia to now become the world's 3rd largest exporter of dates ($ terms) after Tunisia and Iran with an export value of $151 million in 2014. After the Netherlands and France, the UK is Israel's largest market for dates worth $23 million in 2014 with nearly 10,000 tons of Israeli dates being exported to the UK. Hadiklaim, the Israeli Date Growers Cooperative, which includes illegal settler plantations in the Jordan Valley, sells 65% of all Israeli dates. Its brand names include Jordan River, King Solomon, Tamara Barhi Dates, Desert Diamond, Rapunzel, Bomaja, Shams and Delilah. They also supply Israeli dates to supermarkets who market them under their own brand. These include Marks & Spencer, Sainsbury's, Tesco, Asda, Morrisons and Waitrose. Sometimes they are labelled “produced in the West Bank”, remember these are not Palestinian dates. 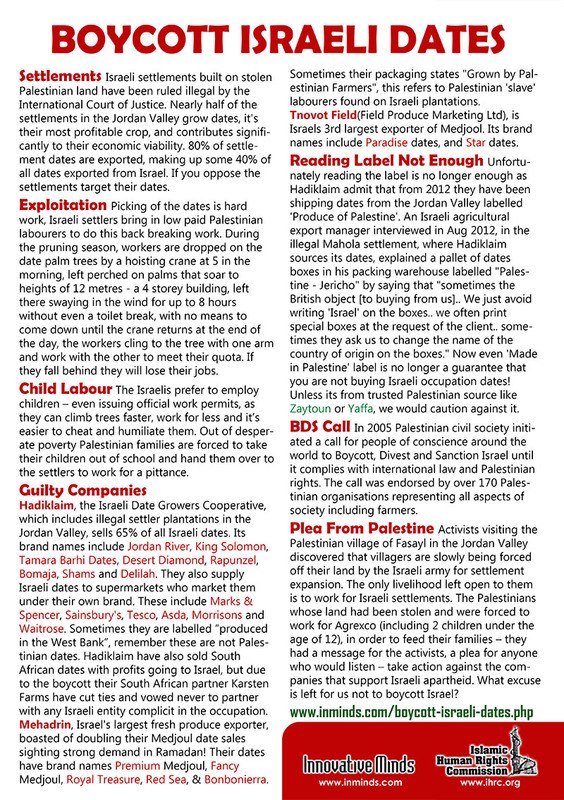 Hadiklaim have also sold South African dates with profits going to Israel, but due to the boycott their South African partner Karsten Farms have cut ties and vowed never to partner with any Israeli entity complicit in the occupation. Mehadrin, Israel's largest fresh produce exporter, boasted of doubling their Medjoul date sales sighting strong demand in Ramadan! Their dates have brand names Premium Medjoul, Fancy Medjoul, Royal Treasure, Red Sea, and Bonbonierra. Sometimes their packaging states "Grown by Palestinian Farmers", this refers to Palestinian 'slave' labourers found on Israeli plantations. 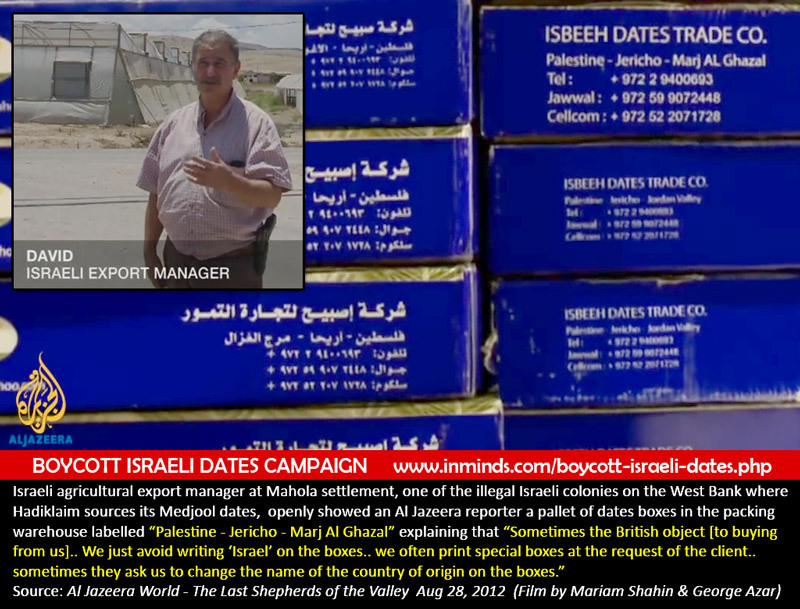 Tnuvot Field (Field Produce Marketing Ltd) is Israels 3rd largest exporter of Medjool dates. Its brand names include Paradise dates, and Star dates. Unfortunately reading the label is no longer enough as Hadiklaim admit that from 2012 they have been shipping dates from the Jordan Valley labelled 'Produce of Palestine' to Europe and Dubai. It's unclear how much of this is from Palestinian farms and how much is from illegal Israeli settlements. An Al-Jazeera report from August 2012 interviewed an Israeli agricultural export manager in Mahola settlement, one of the illegal Israeli colonies on the West Bank where Hadiklaim sources its Medjool dates. He explained a pallet of dates boxes in his packing warehouse labelled "Palestine - Jericho" by saying that "sometimes the British object [to buying from us].. We just avoid writing 'Israel' on the boxes.. we often print special boxes at the request of the client.. sometimes they ask us to change the name of the country of origin on the boxes." There are also reports of Palestinian ministry of economy intercepting 20 tons of Israeli settlement dates on their way to Palestinian packing houses for repackaging for export under the "Made in Palestine" label. Reporters from the Anadolu news in Sept 2014 interviewed several Palestinian merchants in Ariha involved in this nefarious activity. The collaborators admitted "We do trade in dates of the settlements, which we buy at prices that are 40 per cent lower than the market price. And in order to be able to market the dates, we clean and re-package them and choose the best in preparation for selling them in the local market, as well as the Arab and European markets" They estimate the annual volume of his seasonal sales of dates is nearly 350 tons. They use licensed companies that are registered officially. The export process takes place after the official bodies check the quality and specifications of the product, ensuring the product’s conformity with European specifications and international standards. 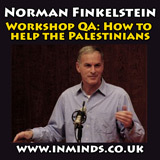 It is then exported under the “Made in Palestine” label. 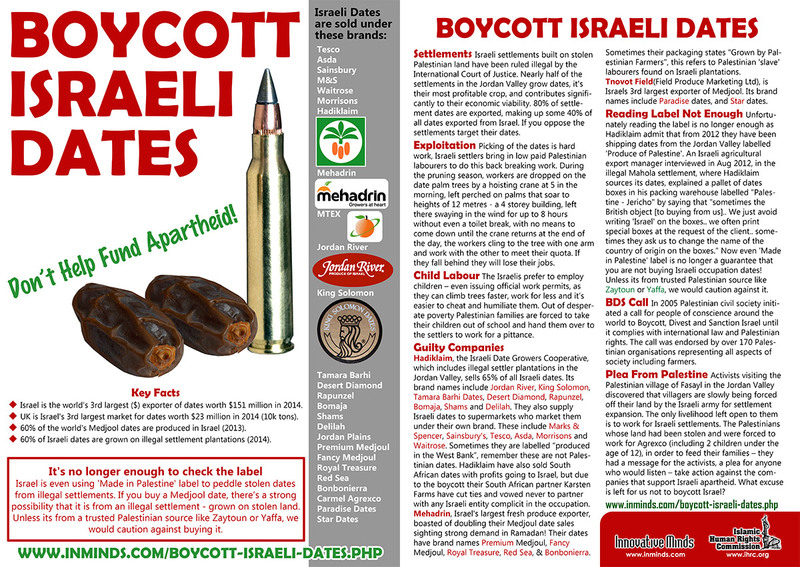 So now even the 'Made in Palestine' label is no longer a guarantee that you are not buying Israeli occupation dates! We would caution against buying any Medjool dates from the region unless they are from trusted Palestinian sources like Zaytoun or Yaffa. In 2005 Palestinian civil society initiated a call for people of conscience around the world to Boycott, Divest and Sanction Israel until it complies with international law and Palestinian rights. The call was endorsed by over 170 Palestinian organisations representing all aspects of society including farmers. Activists visiting the Palestinian village of Fasayl in the Jordan Valley discovered that villagers are slowly being forced off their land by the Israeli army for settlement expansion. The only livelihood left open to them is to work for those same Israeli settlements. These Palestinians whose land had been stolen and were forced to work for the settlements (including two children under the age of 12), in order to feed their families – they had a message for the activists, a plea for anyone who would listen – 'take action against the companies that support Israeli apartheid!' What excuse is left for us not to boycott Israel?